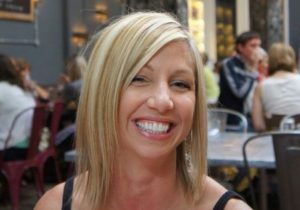 Kelly, RD February 8, 2018 avocado cooking dietitian dinner ideas eating to fight cancer eating to fight disease fad diets healthy cooking healthy meals healthy recipes nutrition nutrition recommendations phytochemicals registered dietitian vegetable recipes Vegetarian meal1 Comment on Beaches, Beers & Tacos!! I never heard of fish tacos growing up. They weren’t sold at Taco Bell or Taco Casa, a local fave. You didn’t see fish tacos on the menu at any Mexican restaurant. These days, fish tacos are being sold in food trucks and restaurants everywhere you turn! Just about every restaurant, grill, bar, cafe, diner and dive on the beach advertises their version of the world’s latest food fascination. Fish tacos originated in Baja and have become the popular menu item of the present. I would like to go to Baja and try those fish tacos!! If you ever come across a Tommy Bahama restaurant, sit yourself down at the bar so you don’t have to wait and order a cervaza and fish tacos. Mike and I agree that these are the best fish tacos we have ever eaten. They may not be fish tacos from Baja, but they won’t disappoint. I found the recipe online and have made them a few times at home. I love all the cilantro in these tacos! Cilantro is a good source of antioxidants that provide benefits to the skin such as helping to prevent sun damage from UVB rays. Many of the antioxidants found in cilantro or coriander prevent many types of cancers. According to research, cilantro has anti-inflammatory properties. Some studies show that the oils in cilantro and coriander leaves have anti-fungal components and may be used in the future for fungal infections, such as thrush. Doing a bit of prep work beforehand will save you a great deal of stress. Making all this at once is no bueno. Trust me. I know. I always think I can get all this done in an hour. Making my life more difficult seems to be my jam. I don’t know why, so don’t ask. 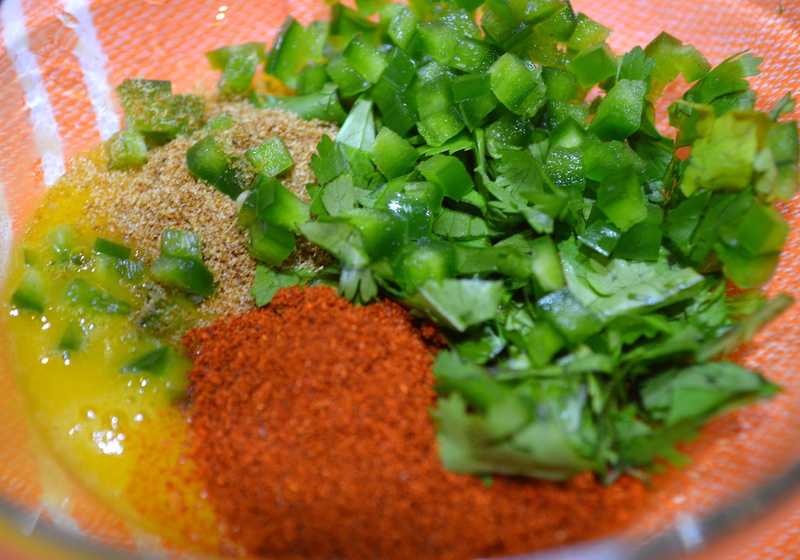 Gather and prepare ingredients for fish marinade. You’ll need about 1 1/2 lbs of fresh fish. We like red snapper, grouper, scamp and cobia but, any white fish will do. Cut the fish into 1 oz pieces. You’ll also need 3/4 cup of unsweetened coconut milk, 2 egg yolks, fresh cilantro, 1 jalapeño, cumin and paprika. *Fresh jalapeño and serrano peppers contain phenols, flavonoids, capsaicinoids, ascorbic acid and antioxidants. Whisk egg yolk until smooth. Roughly chop 1 Tbsp cilantro and mince 1 Tbsp jalapeño. Measure 1 tsp cumin and 1 tsp paprika. Combine ingredients with 3/4 cup coconut milk and mix well. Add fish and marinade to a dish or gallon sized bag and refrigerate for 12-24 hours. Prepare Lime Sour Cream. 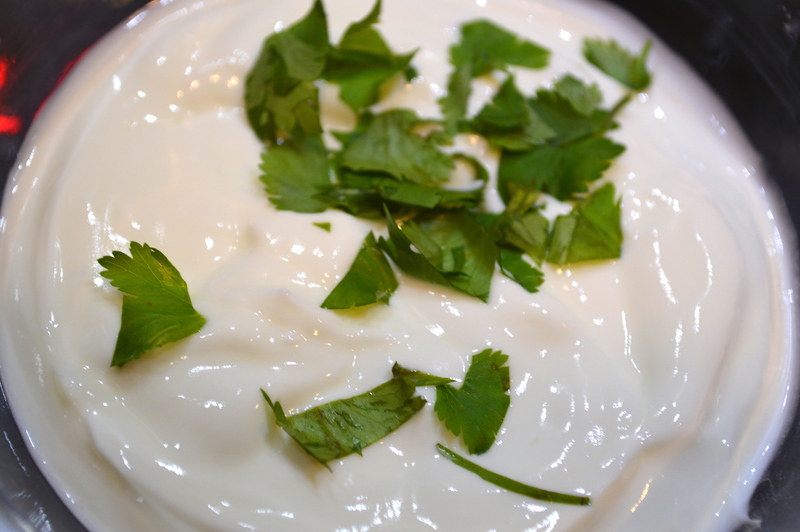 Combine 6 Tbsp sour cream (I used 3 Tbsp sour cream and 3 Tbsp fat-free plain yogurt) and 2 Tbsp freshly squeezed lime juice. This can also be made ahead, covered and refrigerated until ready to serve. Top with roughly chopped cilantro before serving as a garnish, if desired. Andrew insisted on strategically placing the cilantro and I couldn’t have done a better job! 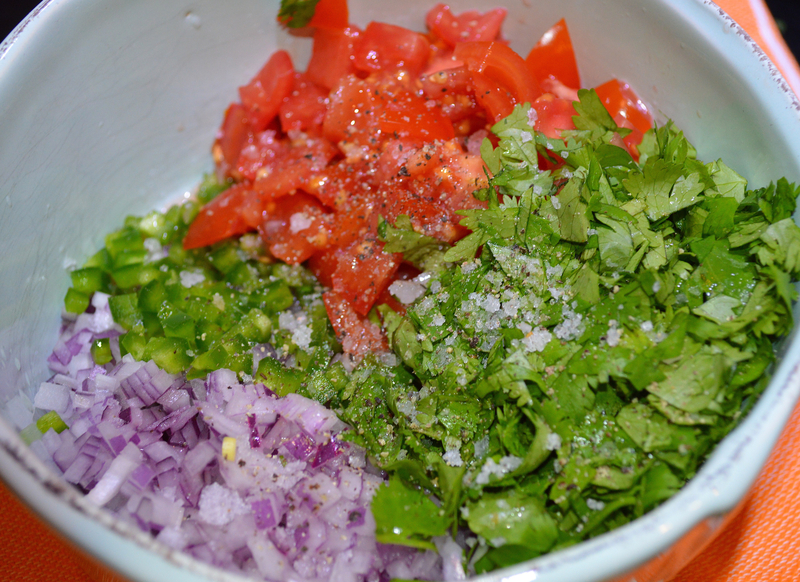 &amp;amp;amp;amp;amp;lt;br /&amp;amp;amp;amp;amp;gt;&amp;amp;amp;amp;lt;br /&amp;amp;amp;amp;gt;&amp;amp;amp;lt;br /&amp;amp;amp;gt;&amp;amp;lt;br /&amp;amp;gt;&amp;lt;br /&amp;gt; Prepare Pico de Gallo. Combine 1/2 cup diced red onion, 1 Tbsp minced jalapeno, 1/4 cup diced vine-ripe tomatoes, 2 Tbsp chopped cilantro, 2 Tbsp freshly squeezed lime juice, 1/2 tsp coarse salt and 1/8 tsp freshly ground pepper. To prepare the Chipotle Aioli, combine 3/4 cup mayonnaise, 1 Tbsp dijon mustard, 1 chipotle pepper, 1 tsp freshly squeezed lime juice, coarse salt and freshly ground pepper into a food processor or blender. 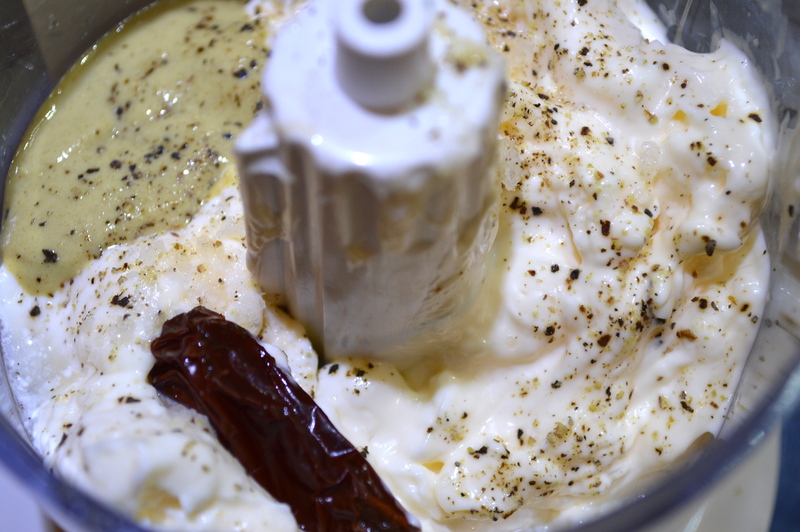 I like to use my small food processor as it is a small piece of equipment and easy to clean. (I’m not sure I could find an actual smoked jalapeño, or chipotle pepper in my area. I can get the powder, the pods and adobo in a can. I picked the can and rinsed the sauce from the pepper before adding it to the aioli). &amp;amp;amp;amp;amp;lt;br /&amp;amp;amp;amp;amp;gt; &amp;amp;amp;amp;amp;lt;br /&amp;amp;amp;amp;amp;gt; &amp;amp;amp;amp;amp;lt;br /&amp;amp;amp;amp;amp;gt; Puree until smooth. This works great in a small squeeze bottle. Refrigerate until ready to use. Last, but certainly not least, the Asian Slaw. 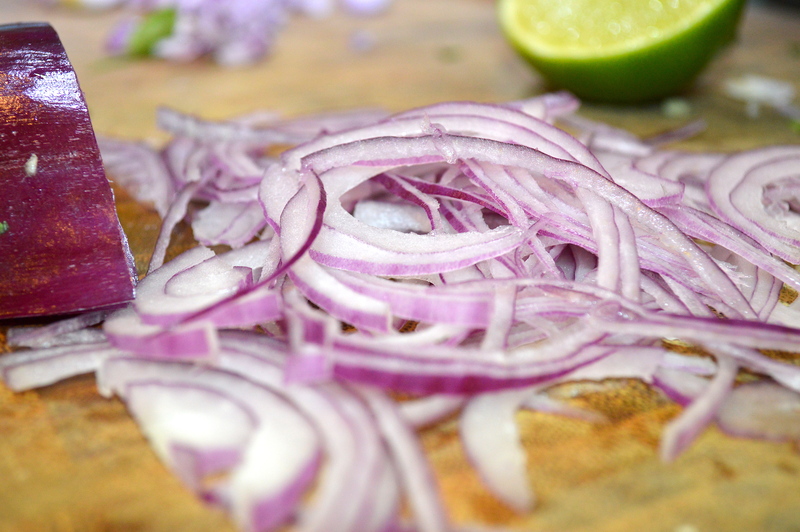 Mix 4 oz shredded cabbage, 1/2 of a peeled and julienned jicama, 2 ounces of red onions, peeled and sliced paper thin or in my case, as thinly as you can slice them (it’s the knife’s fault) and 2 Tbsp chopped cilantro. In a separate, small bowl, combine 2 Tbsp olive oil, 2 Tbsp freshly squeezed lime juice, coarse salt and freshly ground pepper. Whisk and pour over slaw mixture. Toss to coat well. 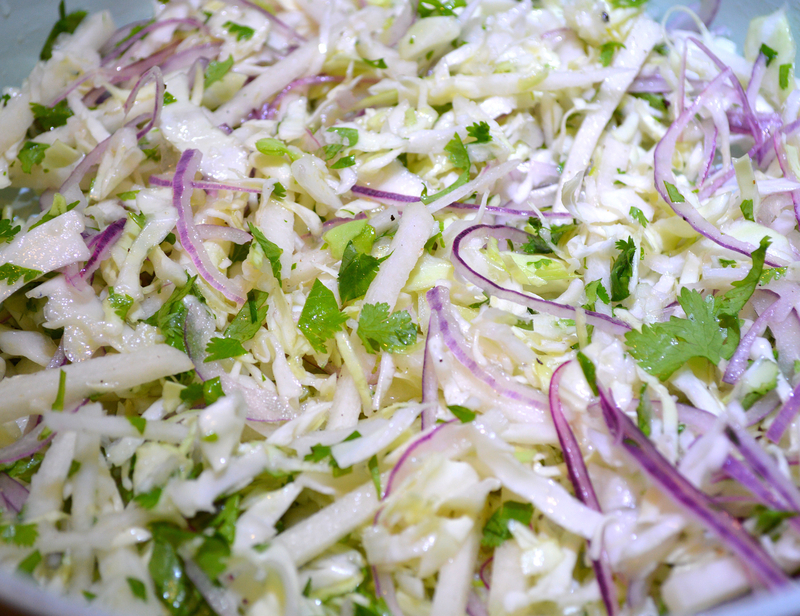 Make the slaw ahead of time, if possible; add dressing just before serving. Preheat a large saute pan and melt 4 oz of unsalted butter on medium-high heat. To cut the fat, use 2 oz of butter and a bit of olive, avocado or grapeseed oil, adding more only if the pan begins to get too dry and the fish begins to stick to the pan. Remove fish from refrigerator. Drain marinade before placing into hot pan. Sprinkle blackening spice over the fish and cook for about 2 minutes. (I used Emeril’s Essence as I didn’t want it to be too spicy for the little monster). Flip fish pieces, cooking 1 minute more or until it becomes flaky. Remove from heat and place fish on a platter. Heat at least 2 corn tortillas per person in a dry skillet or in the oven. Serve hot tortillas, fish, asian slaw, chipotle aioli, pico de gallo and lime sour cream. Sliced avocados would be a great addition. Provide lime slices or wedges for garnish and extra flavor. *phenols play an important role in cancer prevention and inflammation. Flavonoids are scavengers of free-radicals which are involved in the early stages of artery-clogging atherosclerosis and contribute to vision loss. 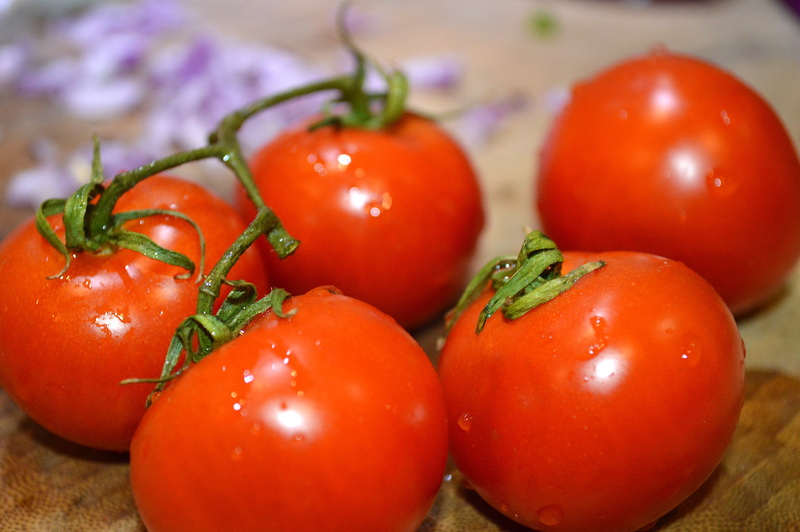 Flavonoids also prevent heart disease. Capsaicin has potential to regulate metabolism. Capsaicin-rich diets have shown favorable effects on atherosclerosis, metabolic syndrome, diabetes, obesity, non-alcoholic fatty liver, cardiac hypertrophy, hypertension and stroke risk. Ascorbic acid protects against immune system deficiencies, heart disease, prenatal health problems, eye disease and skin problems. According to the Harvard School of Public Health, antioxidants may reduce the rate of cognitive decline and may protect against the development of macular degeneration. Don’t wait until Tuesday to make these! I was blessed enough to participate in eating these very fish tacos, and they were worth all Kelly’s hard work! LOL! Simply delicious, and very healthy!